The waiting game. Photo by Thong Vo / Unsplash. While everyone else is refreshing their Instagram feed and hogging the power outlets while on layover, you can make the most of your New York Minute. Act like a New Yorker and beat the waiting game with these mini adventures from JFK Airport. Lose Your Baggage: Storing luggage at the airport costs between $4-$16 per day, depending on the size of your suitcase. You can store at the arrivals section of Terminal 1 (near Alitalia and Olympic) and Terminal 4. Call ahead (+1-718-751-2947) if you have questions you want answered before schlepping over from another terminal. 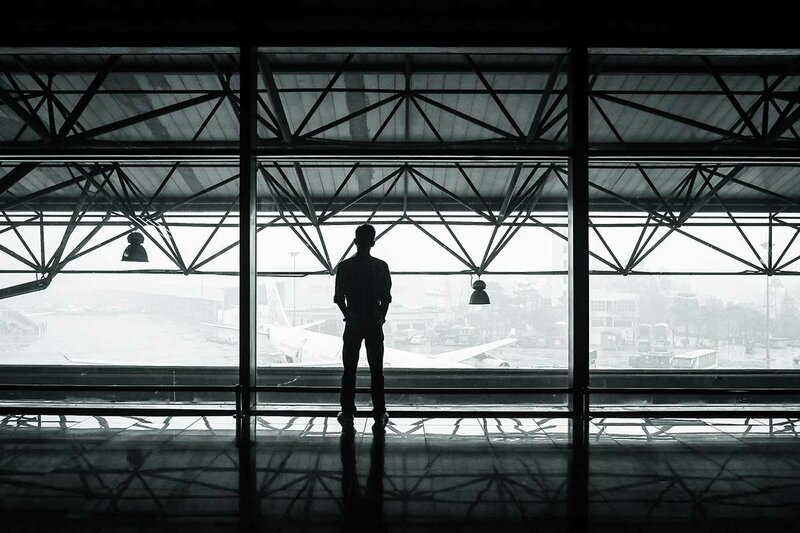 Consider Your Timing: If traveling internationally, factor TSA and customs lines into your layover itinerary. You'll want to clear at least two or three hours of hangout time for any of these expeditions. Nature just outside the airport. Photo by edenpictures / Flickr. Head to: The intertidal salt marshes at Jamaica Bay Wildlife Refuge, a.k.a. the birder's paradise, is one of the most significant bird sanctuaries in the United States. Trails are open from 8:30 a.m.-5 p.m. daily. If it's a gorgeous summer day, head to the the white sand beach at Jacob Riis Park. It's clean and well-maintained, a mellow getaway in the middle of the metropolis. 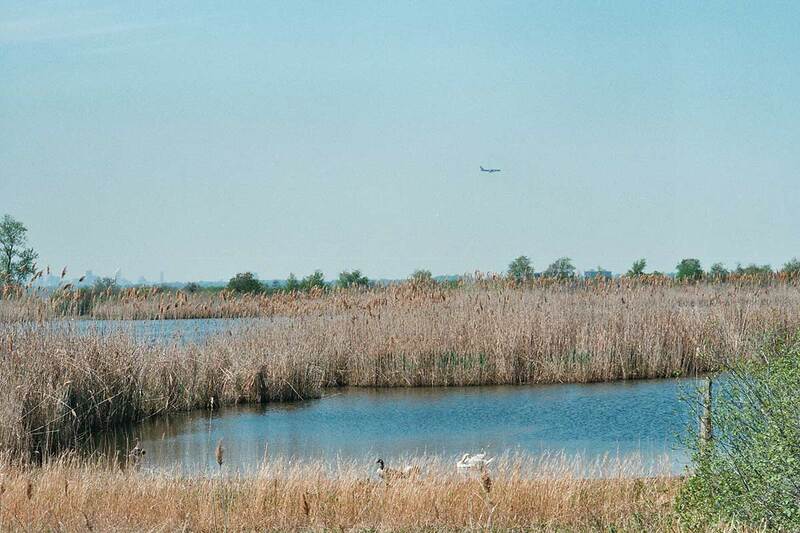 Transport: Hop in a cab at JFK and head to the Visitor Center at Broad Channel Park (for access to tours of the wildlife refuge, bathrooms, other info) or Jacob Riis Park (for the beach). On your way there, plan your cab ride back (arrange a return with your driver or book through Uber). Travel time to and from destination: About 25 minutes each way. Want more travel intel like this? Get our guide full of the 50 best travel tips when you sign up for our weekly newsletter. Cherry blossom season at the Botanic Garden. Photo courtesy of Brooklyn Botanic Garden. 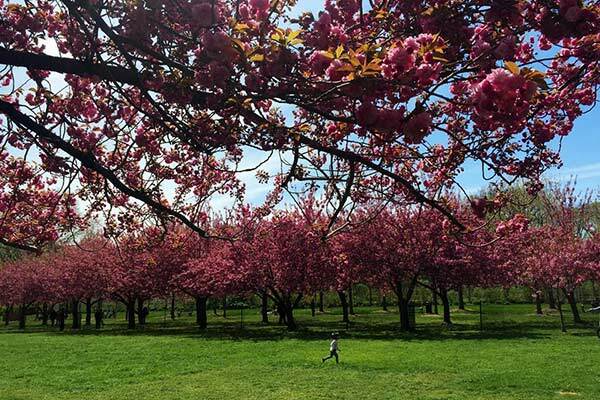 Head to: Brooklyn's 585 acres of pastoral charm in Prospect Park. 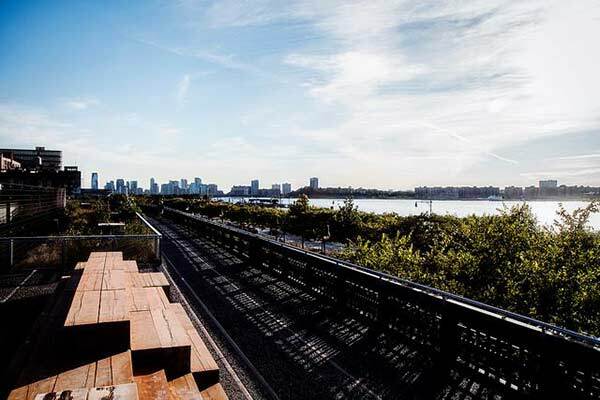 It was designed by the landscape architects behind Manhattan's Central Park. There are impressive watercourses, neoclassical structures, bike lanes, and walking paths. The park is flanked by the Brooklyn Public Library, Brooklyn Museum, and Brooklyn Botanic Garden, which are all worth a visit. An excellent greenmarket is held year-round on Saturdays (8 a.m.-4 p.m.) at the Grand Army Plaza entrance. Transport: Hop onto the Airtrain ($5) at JFK Airport and get off at Jamaica Station (about 5-15 minutes depending on which terminal you’re leaving from). During the day, catch the Long Island Rail Road (LIRR) to Atlantic Terminal (about 19 minutes) and arrive in Downtown Brooklyn. You can look up LIRR rail schedules here. If you have time and it’s a nice day, take 20 minutes to walk to Prospect Park via Flatbush Avenue, stopping along the way at BKLYN Larder for made-in-NY provisions and the Doughnut Plant for handmade, fresh-from-the-oven deliciousness. Otherwise, take the 2/3 train at Atlantic Terminal two stops to Grand Army Plaza (about 8 minutes). Travel time to and from destination: About 45 minutes each way. Views from The High Line. Photo courtesy of The High Line. Head to: The State Grill and Bar at the very nearby Empire State Building (from Penn Station, a quick walk east on 34th Street). Smooth cocktails (how about a Manhattan) are served in a Deco space. If you can stand the line, head to the top for a looksie over the city, then roll over to the iconic dining room at Keen's Steakhouse (dating back to 1885) for dry-aged steaks and brandy. Koreatown (K-Town) is just one block from Penn Station (34th Street, between Seventh & Eighth Avenues), a neat little stretch from 31st-33rd Streets, between Fifth Avenue and Broadway where you can find bimbimbap joints, karaoke bars, salons, and knicknack shops. Go to Gaonnuri for fancy Korean dining, Turntable Mad for Chicken for cold beers and wings, or Hangawi for delicate and delicious vegetarian served at low-lying lacquered tables. Due west of Penn Station is the entrance to the The High Line (34th Street, at Eleventh Avenue), the elevated boardwalk that winds frrom Midtown down to the Meatpacking District. As you stroll downtown on the path (1.5 miles), you'll find dramatic balconies, overlooks, native plants, water features, resting places, and snack stops. Once you reach the end, you can hop a cab back to Penn Station or catch the A, C, E subway line (14th Street, at Eighth Avenue) uptown to the Penn Station stop. The exit is conveniently located inside Penn Station, giving you quick access back to the LIRR and airport. Transport: Hop onto the Airtrain ($5) at JFK Airport and get off at Jamaica Station (about 5-15 minutes depending on which terminal you’re leaving from). Catch the Long Island Rail Road (LIRR) to Penn Station (about 23 minutes) and land in the heart of Manhattan, at tourist-blazing 34th Street. Travel time to and from destination: About one hour each way. Discover the best books about the Big Apple, the city's best places to work remotely, and the absolute best hotels, restaurants, shops, and nightlife in town.